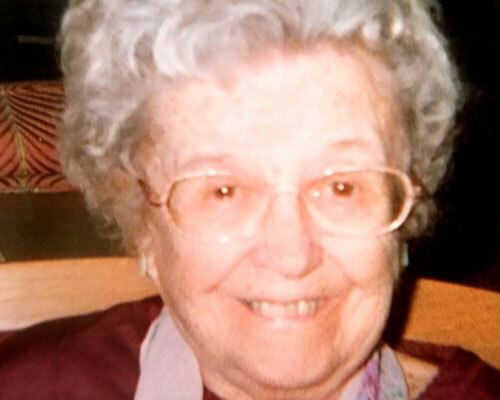 Sophie P. Kosciewicz, 104, of Haverhill, MA passed away peacefully Wednesday, March 13, 2019 at The Country Center for Health and Rehabilitation in Newburyport, MA. She was the devoted wife of the late Mitchell Kosciewicz. Sophie was born November 4, 1914 in Haverhill, MA the daughter of the late Anthony and Anna (Szeliga) Drelick. She was a lifetime resident of Haverhill having attended local schools and graduating from Haverhill High School. Sophie was employed as a stitcher in the Haverhill shoe manufacturing industry. She later worked in the kitchen of the Tilton School in Haverhill. She was a devoted woman of faith and a lifelong communicant of Saint Michael’s and All Saints Parish in Haverhill. Sophie was a member of the All Saints Parish Choir and a member of the Holy Rosary Society. She enjoyed sewing, gardening and traveling. She was proud of her Polish heritage and especially loved cooking Polish food for family and friends. Sophie is survived by her nephew John Wezowicz of Haverhill, MA and niece Elizabeth Roberts and husband George of Newburyport, MA. She also leaves behind several grand nieces and nephews and many friends in the faith community she loved so dearly. Family and friends are respectfully invited to attend visiting hours Friday March 22, 2019 from 9: 00 – 10:30 AM at The Grondin-Carnevale Funeral Home, 129 Kenoza Ave. Haverhill, MA 01830. A funeral mass to celebrate Sophie’s life will be held Friday immediately following visiting hours at 11:00 AM from The All Saints Parish, 120 Bellevue Ave, Haverhill, MA 01832. Burial will take place at Saint Patrick Cemetery in Haverhill. In lieu of flowers donations may be made to The American Cancer Society by visiting https://www.cancer.org/involved/donate.html. For directions or online condolences please visit www.GrondinCarnevale.com.